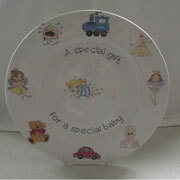 All pottery is dishwasher safe and therefore can be either used or kept for display. 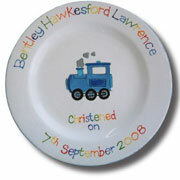 These make an ideal personalised gift for a special Birthday, Anniversary, Christening or Wedding. 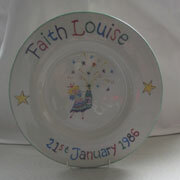 I have a range of pottery items for you to choose from, you then choose from my many designs decide upon the colour scheme you would like and leave the rest to me. The finished item is ready for collection in 2/3 weeks; I will however endeavour to complete the item in a shorter time if needed.